Alison Shaffer: Sharpie markers work with a click! Even easier to use. Sharpie markers work with a click! Even easier to use. There is likely a point in each day we reach for a marker or pen. 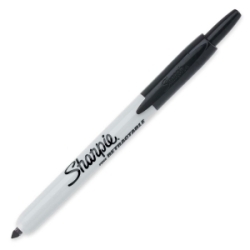 Sharpie Brand is one we reach for when addressing a packaging, doing a school project or writing an important note. I'm usually writing something down fast, have my hands full with papers, or laundry and now Sharpie Markers are retractable, as in no cap! For easy, one-handed operations use fine point retractable markers. There’s no cap to remove or misplace. Superior seal is made possible with the Safety Seal valve design which prevents markers from leaking or drying out. It features fade-resistant, water-resistant, quick-drying ink. It’s permanent ink marks on most hard-to-mark surfaces and is certified AP nontoxic. Learn More and see the available colors in the retractable markers. They are easy to use and have the same great quality we all know about Shaprie.